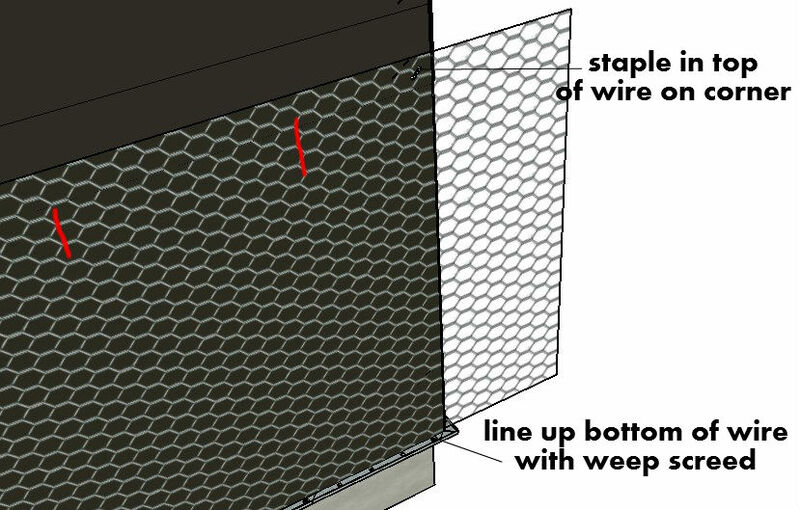 ​Installing the stucco wire is a lot like installing the paper, at least when it comes to installing it but different staples are uses. They are larger and penetrate the shear and stud. The first run uses the same principals that we discussed when installing the paper, keep the bottom edge of the wire in line with the weep screed, staple the top edge and fasten the remaining wire. The two main principles are to have the wire touching the weep screed and having your wire tight before stapling it off. 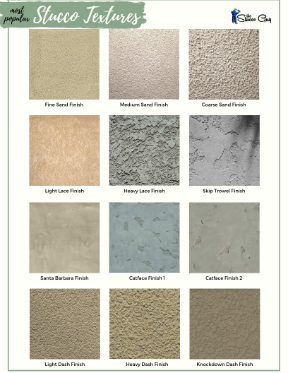 It is a lot easier if you pre-cut the wire ahead of time and saves a little bit of time, in my opinion, especially if you are new to stucco. 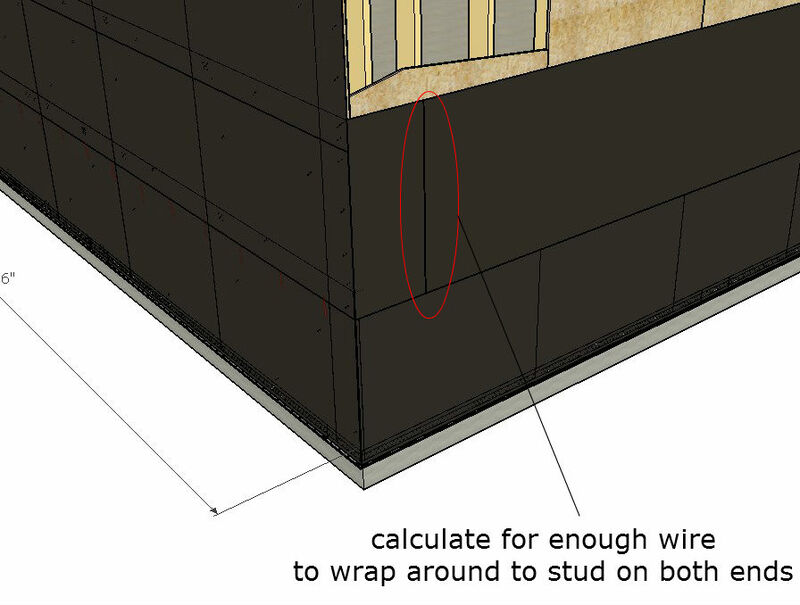 When you’re measuring, make sure you calculate enough wire to wrap around the corner and end on a stud, so you have something solid to fasten the wire to. 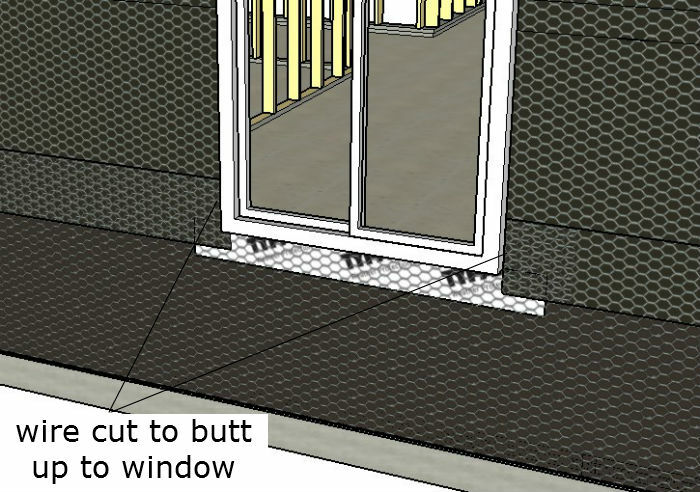 Smaller windows and even doors can be cut out afterwards but calculate how many strips to cut at a certain length and use your own judgement if you should stop and start a new measurement to eliminate as much waste as possible. Hold your wire up to the wall and make sure the bottom edge of the wire is straight in line with the bottom edge of the weep screed. Let the necessary amount of wire hang past the corner so you can attach it afterwards to the stud around the corner. Next, put a staple in the top of the wire, right at the corner of the building. This will hold the wire in place while you roll it out along the wall. Staple the top edge of the wire along the entire length of the wall, stretching it a little as you go and making sure that the bottom edge of the wire is still straight with the weep screed. When you are pulling on the wire to stretch it as you go, use a light to moderate pulling motion so the wire is tight but ​avoid over tightening. After the top of the ​wire is stapled, you’ll want to fasten the rest of it down, starting in the middle and working your way outwards. First, run your hand down the middle portion of the paper, starting from the top and working downwards. As you slide your hand down, you are ensuring that it is laying flat against the substrate and there are no major wrinkles. Throw a few staples in the paper after the paper is taught. The rest of the runs are simple, you just need to have enough overlap on where the wire meets (both horizontal and vertical joints) and you work the wire the same exact way. 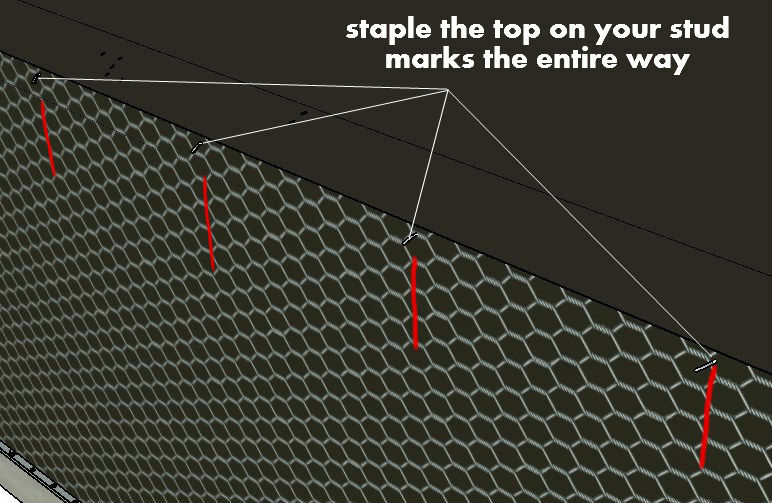 Staple the top edge first, making sure you have three bubbles overlapped and staple the top of the wire along the entire wall. Then tighten the wire and staple it off using a 6 and 12 pattern. 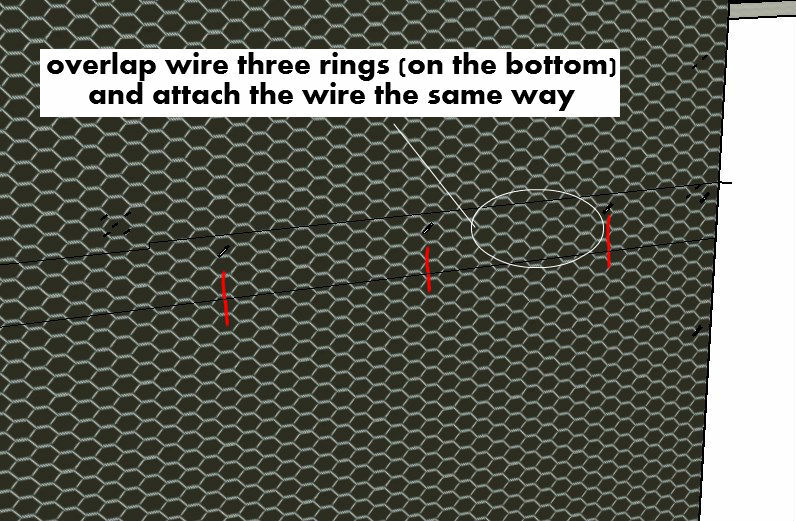 To keep things simple, just make sure that the overlap on the new piece of wire is three rings, like the picture illustrates. This is what we are going to use for our horizontal seams (roughly 4 1/2″). The vertical seams only need to be overlapped 6″ but it will be a bit more in this example because we are sticking to one method to be as efficient and seamless as possible. 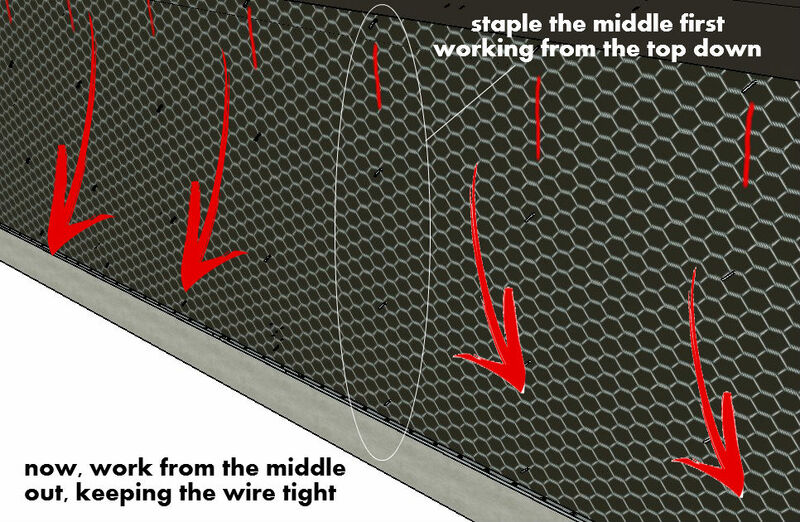 Use the same method that we used for the first piece of wire, stapling the top edge along the entire wall, working the center of the wire down and then working outwards in both directions from there. 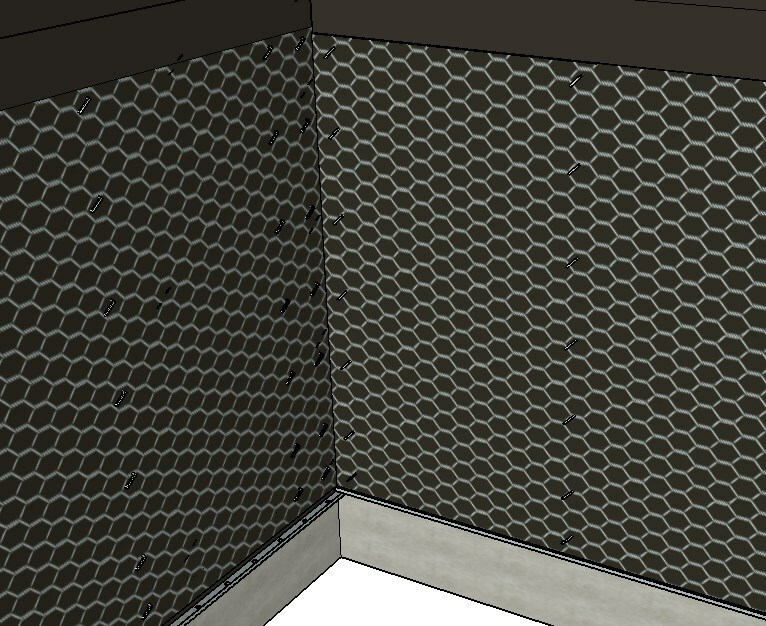 The outside corners will get wrapped around the corners and then our new piece will overlap that starting at the corner, making a neat and clean transition. We will want to staple the wire to the corner before we wrap it around the corner, this will prevent bubbles from forming and make a nice sharp turn. Start by stapling the middle of the wire and then stapling the top and bottom edges. Then you will want to put a staple in between those so we can fold the wire around the corner. Then you will want to bend the wire around the corner using your hand, so that the wire has a sharp bend to fit the 90 degree corner snugly. Then staple the opposite side of the corner starting in the middle, then the top and bottom edges, then in between those, like we did earlier. Then staple off the edges of the wire on the stud that we are attaching the wire to. 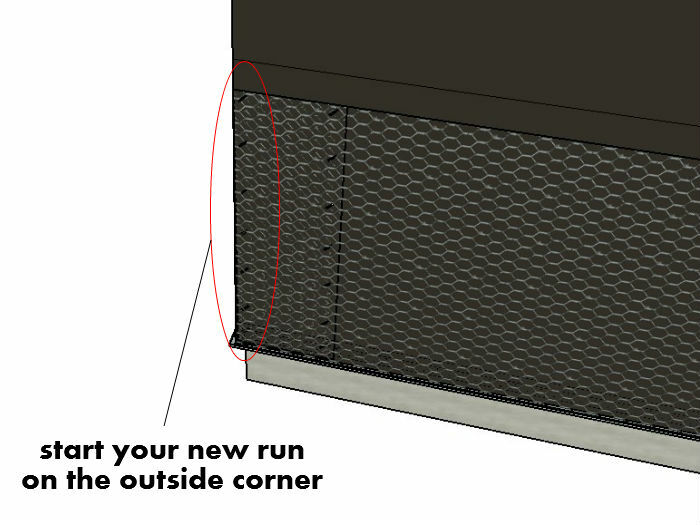 Now start your new run on the edge of the corner and the only seam you will have will be on the corner… nice and neat! That will get covered by corner aid so essentially, it will be seamless. 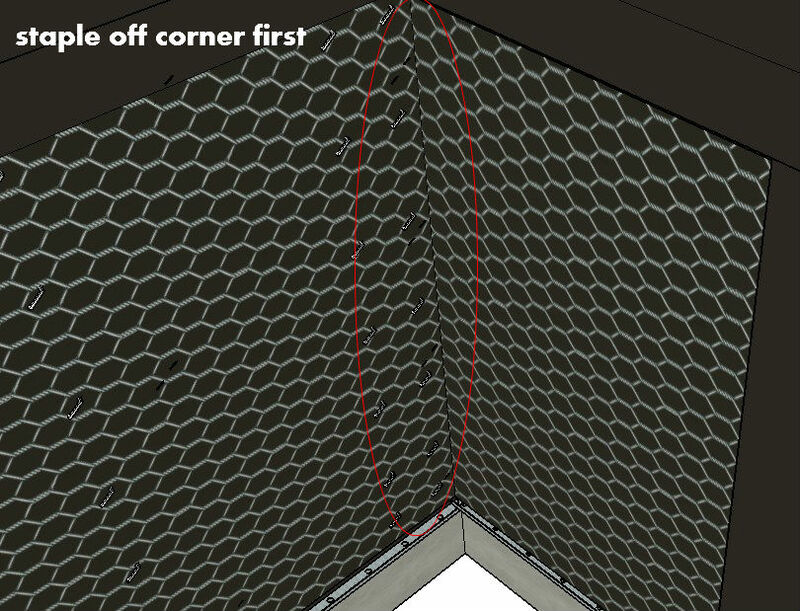 Inside corners are really no different than outside ones, you simply bend the wire the opposite way and fasten the wire systematically, in the same way. 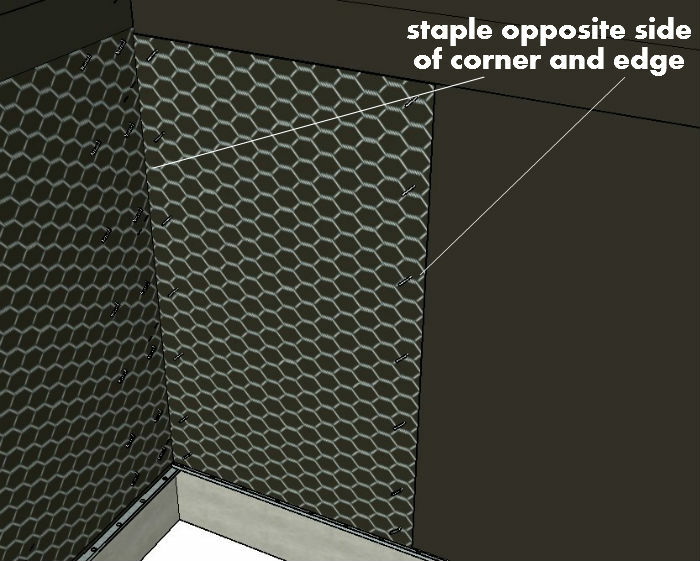 First, you will want to pre-cut lengths for the wall with enough overlap to wrap the inside corner and reach the next stud on the wall and fasten the wire to the wall until you get to the corner. 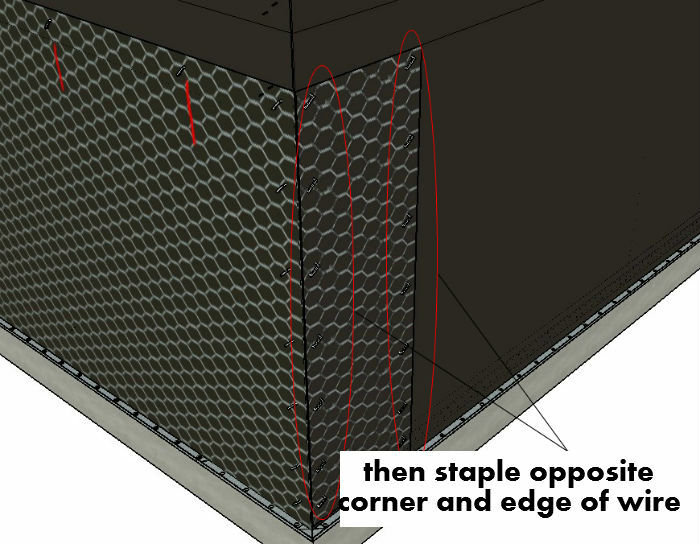 Then, you will want to staple the corner like we did for the outside corner, middle, top and bottom and then in between. After it is stapled, fold the wire on to itself with your hand to make a nice crease that will fit tightly into the corner. Now, move the wire so that it is tightly fitted into the inside corner and staple it off with the same pattern/sequence as described above. 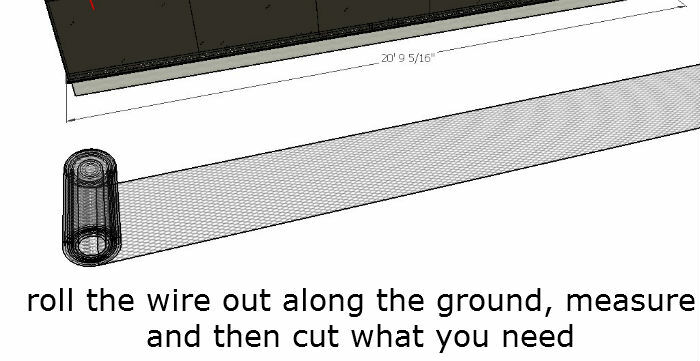 After that is stapled off, stretch the wire and finish stapling off the remaining edge to the substrate, making sure you are fastening it to the stud as well. Now you can start your new run of wire from the inside corner and have a seamless transition with no loose wire sticking off the wall. ​You can do windows 1 of 2 ways, either run the wire over them and cut them out afterwards or you can stop right at them, having measured and pre-cut the piece of wire to compensate. The first method is basically going over the window and then cutting it out afterwards. This is a little faster than the other method. 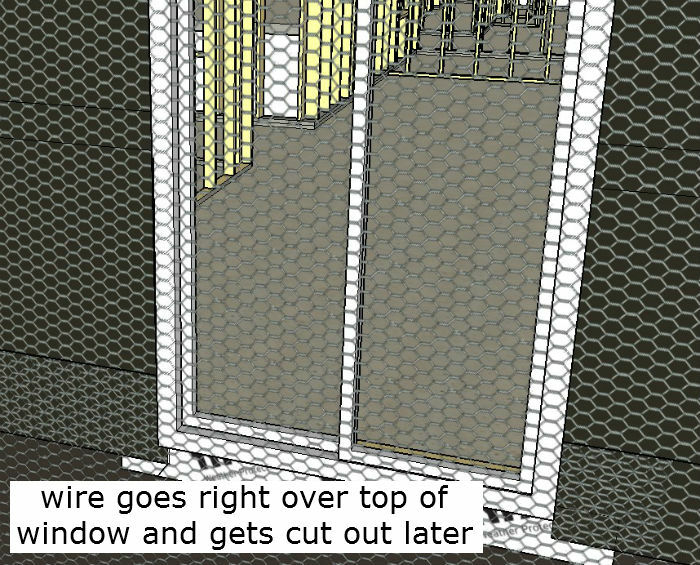 Be careful not to scratch the window frame and/or the glass when using this method… remember the wire is metal after all! The second method will require a little more calculating but is easier to install and won’t put the window at risk for damage.